The frame of this pectoral is curved and has been embellished with colourful inlays. It depicts a chapel with an elaborately dressed and bejewelled figure of the god Shed. He is shown with a side-lock of youth and a quiver with arrows hanging from his shoulder. 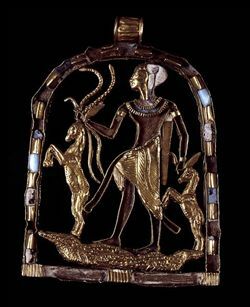 In his hands he holds serpents and gazelles, and he is standing on two crocodiles. The animals as well as the kilt and face of the deity have been chased in gold leaf. The torso and other body parts were inlaid in a red material which is now lost. On the back of the pectoral the principal details have been chased into the gold leaf. Eggebrecht, A. (Hrsg. ), Suche nach Unsterblichkeit : Totenkult und Jenseitsglaube im Alten Ägypten, Hildesheim - Mainz 1990, Kat.-Nr. T 24. Eggebrecht, A. (Hrsg. ), Pelizaeus-Museum Hildesheim : Die ägyptische Sammlung, Hildesheim - Mainz 1993, Abb. 62. Schmitz, B., Ein neuer Beleg für den Gott Sched : Amulett Hildesheim Pelizaeus-Museum 5922, in: Bryan, B.M. & Lorton, D. (Hrsg. ), Essays in Egyptology in honor of Hans Goedicke, San Antonio 1994, S. 255-263. Seipel, W., u.a., Ägypten : Im Reich der Pharaonen; Auf der Suche nach Schönheit und Vollkommenheit, Leoben 2001, Kat.-Nr. 192.